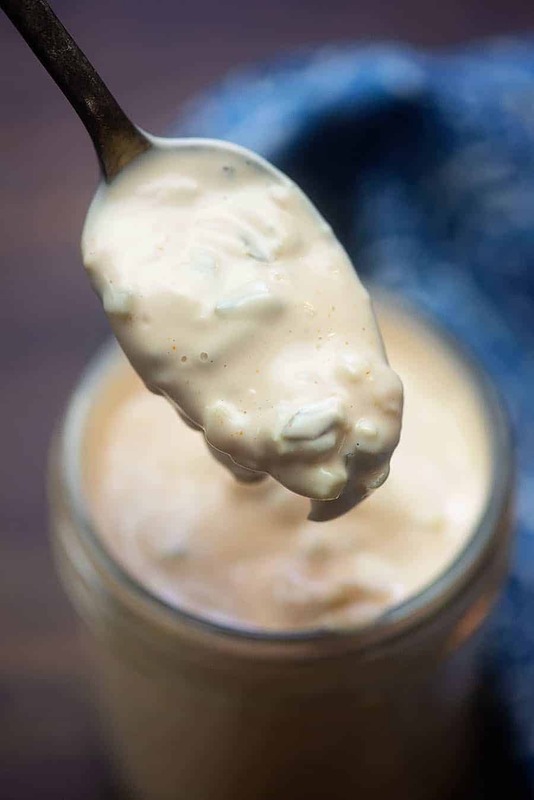 Thousand Island dressing is a total staple in our house. It’s easy to whip up, is much healthier than the bottled version, and it’s delicious on salad or as a dip for burgers or chicken. I’m a total sauce junkie. I admit it. When we go to restaurants, the thing I’m most interested in is what kind of sauces they have. I’ll dip my steamed broccoli in just about anything. I’ll drizzle my salad with all kinds of goodness. Grilled chicken always needs a sauce. A bunless burger gets even more delicious when you top it off with something flavorful. 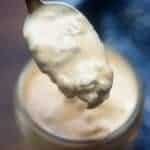 Of course, many store-bought and restaurant-made sauces are loaded with sugar which means carb city. 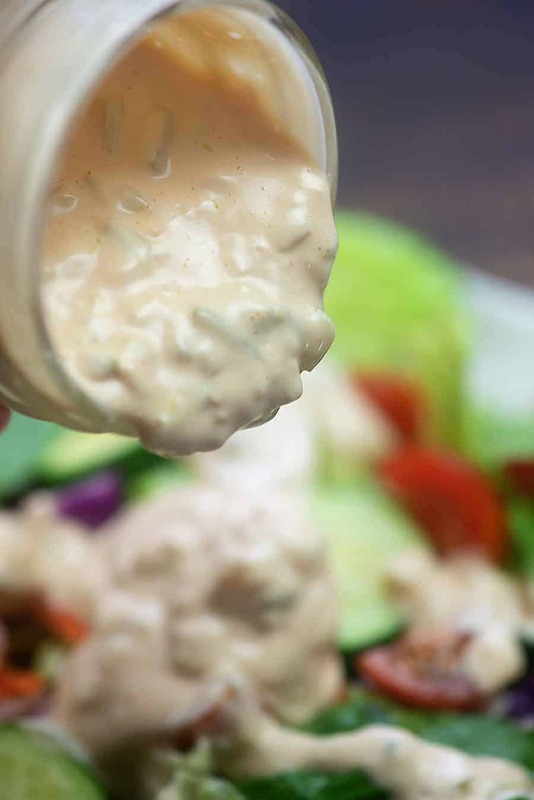 Have you ever checked the nutrition label to see how many carbs are in thousand island dressing? It can be quite a lot. Not today, friends. 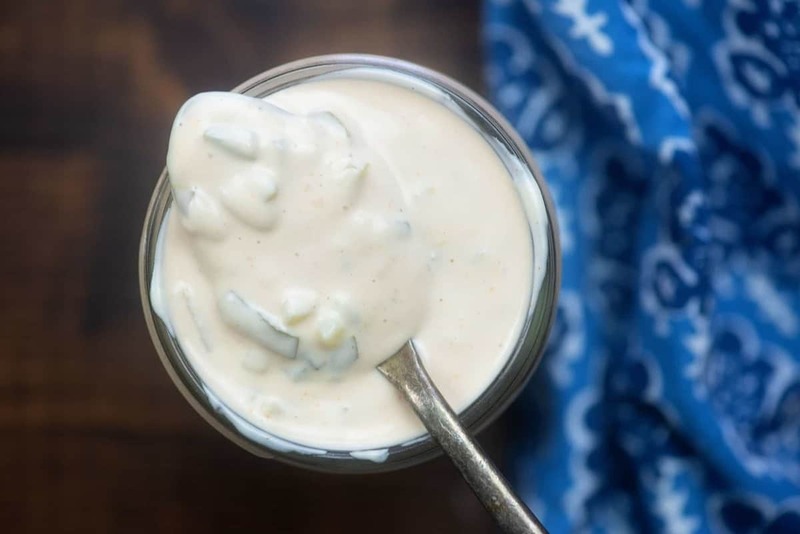 This homemade thousand island dressing recipe is beyond easy and just uses a handful of ingredients that you probably already have in your fridge! You’ll need some mayonnaise, reduced sugar ketchup, pickle relish, white distilled vinegar, salt, and a pinch of sweetener. I always buy and use Heinz no sugar added ketchup. (affiliate link) It’s my favorite and my kids don’t notice any weird aftertaste. Now, I’m going to get a little controversial here – I use dill pickle relish in my 1000 island dressing. A lot of people use sweet relish, but I’m just not about that life. If you do go for sweet relish, make sure to find a version using a sweetener instead of sugar. Those carbs can really sneak up on you! Now that you’ve gathered your ingredients, you literally just toss them in a bowl and whisk them together. It doesn’t get easier than that! I store my homemade thousand island dressing in a mason jar in the fridge. Personally, I keep this for dressing for 2 weeks. We’ve usually used a batch this size in that amount of time and I feel completely safe eating it during that time. I err on the side of caution and toss any remainders. 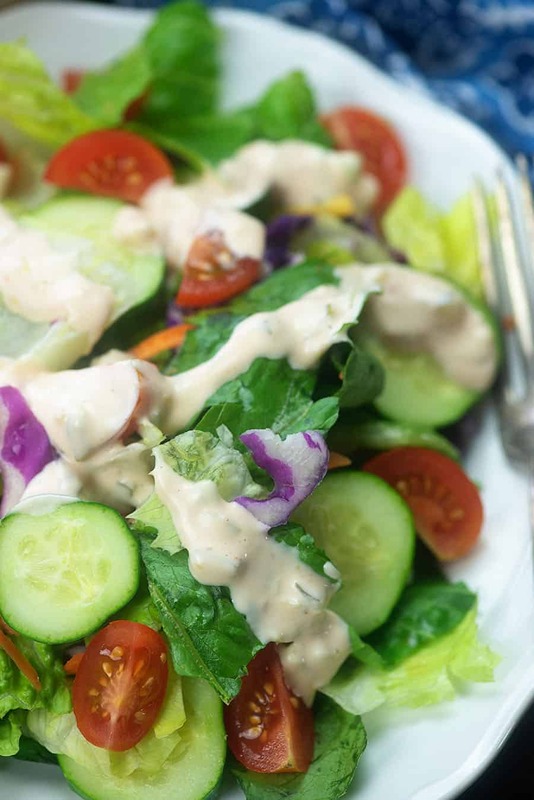 If you love this salad dressing, be sure to try my homemade ranch dressing too. It’s so thick and creamy and packed with herbs. Mustard BBQ Sauce: I drizzle this over pulled pork for the ultimate combo. Garlic Butter Shrimp: Easiest dinner ever!! 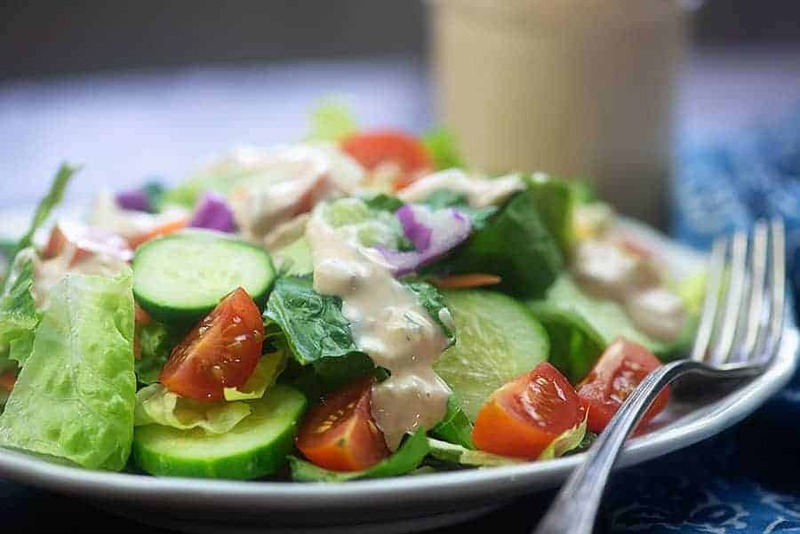 Cucumber Salad: So perfect! I make this ahead and eat it all week. Brussels Sprouts with Bacon: If you’re trying to convince the kids to try Brussels sprouts, this is how to do it! 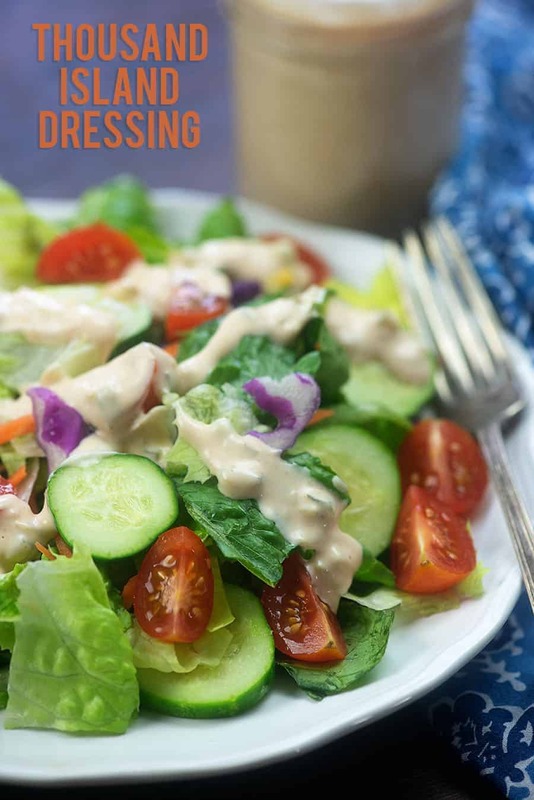 This thousand island dressing is perfect drizzled over a salad, but I really like to eat it with bunless burgers too! Add all of the ingredients to a small bowl and whisk well to combine. Taste and add additional salt or sweetener as desired. Store in a mason jar, tightly closed, in the refrigerator for up to 2 weeks. Use sugar free sweet relish, if preferred. I think this is a great idea and have no worries that it won’t easily last 2 weeks; maybe longer. You probably purchase a jar of mayo that is larger than 1 cup and use it until gone. With you dressing you are adding ingredients that will extend it’s life such as the salt which is a preservative and the vinegar. 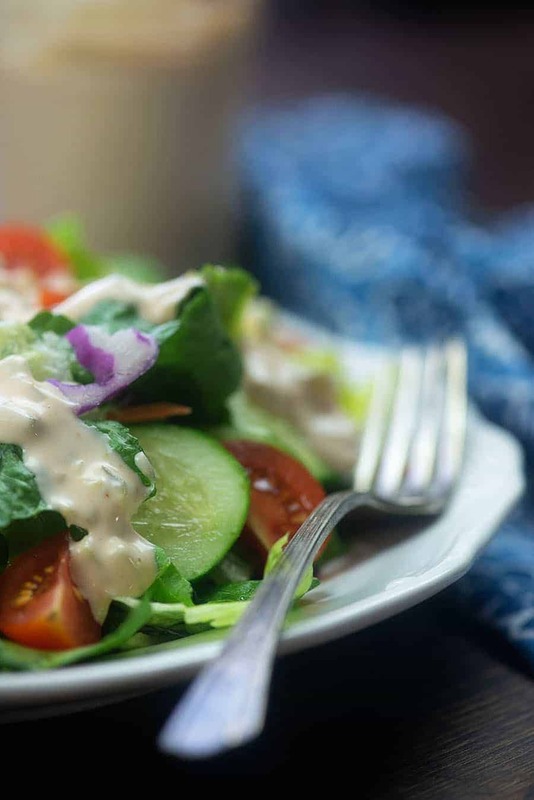 You should not have any worries about your dressing being safe for two weeks or so unless you leave it unrefrigerated longer than necessary or lose electrical power for an extended time. Thanks for all the great recipes! You seem to think outside the box on your recipes and bring us “regular” food we want to eat daily and not something that takes a lot of ingredients we don’t have to make a dish we’re not sure we are going to like. If we have most of the items in our pantry or fridge, we are probably going to like what you come up with-great job! Thanks so much, Vickie! Appreciate the kind words! Made it, ate it on…burgers, hot dogs, salad, chicken wings, sandwichs. GOODER! AND, Ditto what Vickie said! Made this yesterday for dinner last night, bunless burger & salad. We used it on both & my hubby, who is a 1000 Island addict declared it a winner. Me too! I love finding dressings that aren’t oil & vinegar which I don’t care for. 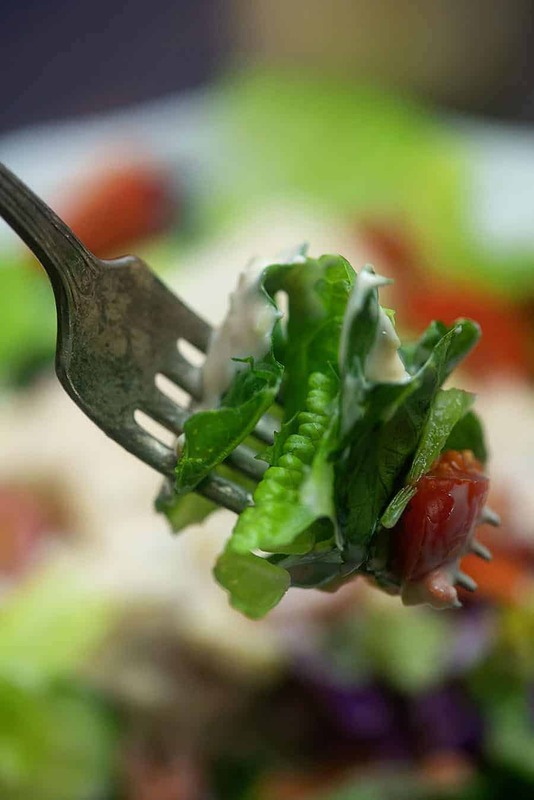 This makes salads something to look forward too! I didn’t add the sweetener since I used G Hughes sugar free ketchup & it is sweeter than Heinz. I bought 3 bottles & needed to use it up, don’t care for it on its own but it worked perfectly in this. Thanks for another great recipe Karly! So glad you enjoyed the dressing! I’ve never seen the G Hughes kethcup, but good to know it’s not so great! The ketchup is ok, not as good as the Heinz tho. I am also not crazy about the G Hughes BBQ sauces, I think they are all too sweet but others like them. Plus high on the $$$ side too. Best to make my own I think. Thanks again for this recipe, we both really like it! So delicious! Much better than the bottled crap I’m used to eating, very happy I decided to make my own. Thanks for sharing your recipe! Will using apple cider vinegar instead of white vinegar make much of a difference? I want to make this but apple cider vinegar is all I have on hand.